Yesterday was an intense day. Too many appointments, the prospect of lots of lab work for Nik, and the question mark about whether or not he did, in fact, have a rotavirus. You know, just another ordinary day in our lives. We had a great appointment with a new doctor, an allergist, to help us make some headway into figuring out the causes of Nik’s ongoing pains and recent skin rashes. We left feeling really good —despite a long list of allergens to be tested. The doctor was personable and Nik seemed to take to him. Always a bonus. The day took a nosedive from there. The appointment with the pediatrician, to discuss Nik’s recent apparent illness and whether to culture for a rotavirus, ended up not happening. The nurse that had scheduled the appointment had not confirmed it in the computer. When we arrived, we were told that the second doctor in the office had a family emergency; that left Nik’s doctor, Doctor Mary, holding the bag for all the appointments for the day. Since Nik seemed to be so much better than he had been even twenty four hours prior, we opted not to wait in the hopes she could see us. We headed over to the lab to get the blood drawn for Nik’s battery of tests. After a lengthy wait, we were greeted by a seemingly disorganized lab tech. As soon as she realized the tests were for Nik, she balked. Whether it was because it was so close to the end of her day and she didn’t’ feel like dealing with a screaming child or whether it was simply because she felt like it, she told me she couldn’t do the tests because it would require more blood than she could take from a child at one time. I’ve since discovered that wasn’t true but, whatever. So, a lengthy day spent traveling up and down the middle portion of our state, bouncing from appointment to appointment —it made us tired and cranky. By the time we got home, we decided to go out to dinner. As luck would have it, both Nik and I had reactions to some food. Neither was too bad, but it was enough to make us both uncomfortable. I woke this morning feeling pretty tired and crabby; a state I must confess lingered until about lunchtime. I’ve been sitting at my computer, willing myself to find words to write —and coming up dry. I’ve also been listening to my son singing and playing happily in the loft. For some reason, it put me in mind of this post from Kristen. I realized I could choose to be angry and resentful about all the energy expended yesterday —seemingly for naught, or I could choose to find something good to hold onto. I chose the latter —in the form of a cookie. Yes, a cookie. And french fries, too. Since we’ve been limiting Nik’s exposure to potential allergy-inducing foods, the allergist warned us that it might actually skew the testing. He actually suggested that we feed Nik some of the foods we’ve come to suspect —especially wheat —in order to trigger an immune response. So, with that in mind —and thinking we were getting blood drawn in the afternoon —I bought Nik a giant chocolate chip cookie. Okay, let’s be honest; it was as much for me as it was for him. But we shared that cookie in the Starbuck’s parking lot like it was manna from heaven. 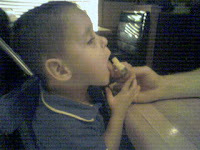 It was Nik’s first-ever chocolate chip cookie. Yeah, okay; big deal, right? Right. 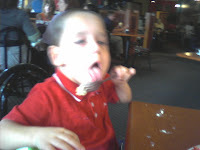 The cookie was fairly chewy and soft so I was able to mash up bits and pieces and slip them into Nik’s mouth. Normally, he would either gag or reach in to remove anything larger than a single crumb, but this cookie was sweet and gooey and melted quickly. And he adored it! By the time we were through, Nik had consumed nearly a quarter of the cookie; much of that he even placed in his own mouth —another first —instead of licking it off of my fingers! While we’ve been trying to mitigate all these weird reactions to foods, we’ve had to severely limit Nik’s oral intake; it’s just so challenging to find things he will eat that are the right consistency and texture that are not potential allergens. 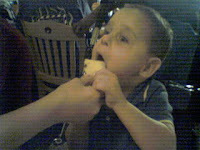 We’ve been more than a little concerned that he might regress in his desire or ability to eat by mouth. So, after the allergist told us to “stimulate his system,” we decided to really go for it. When we went out to dinner last night, we let Nik have some of a buttered roll, a lick of my patty melt —he even tolerated a very small crumble of beef on a fork without gagging—and, of course, french fries. Nik’s favorite thing to do with fries is to dip them in either Daddy’s salad dressing (usually honey mustard) or in ketchup. His favorite thing to do last night? Show off his ever lengthening reach and lightning quick food-snatching skills. 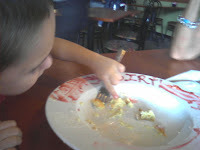 At one point, I wasn’t fast enough to stop him; Nik helped himself to a fistful of fries off the plate. The boy’s hands are definitely getting bigger, too! Nik did have a bit of a reaction to all those foods and was a cranky, uncomfortable boy by the time we got home —clawing at his ear, pulling his hair; we gave him a quarter dose of Atarax at bed time and another half dose five hours later. He slept through the night and has had relatively few side effects today. The allergist gave us a prescription for Allegra to see if that will help with the symptoms without causing the neurological side effects. We will start that after the blood draw on Monday. Meanwhile, we’ll be sharing cookies —with our glasses half full. In spite of an inauspicious beginning to the day, my 45th birthday ended up being full of so many small and unexpected delights that I was giddy by the time I collapsed into bed around midnight. Might have something to do with that mojito at dinner, but I don’t think so. First there was my husband’s beautiful card; it was so deeply moving that I wept. He is not a man of many words or effusive emotions; his actions speak volumes more than his words ever can or will. Yet each time he gives me a card, it says all those deeply heart felt things a girl could ever wish for. And I know he means every word of it. Next, came a fabulous session of feeding therapy. It was fabulous for so many reasons but the true standout event was that Nik fed himself yogurt. Voluntarily. With a spoon. Many times. He even placed the spoon in his mouth in the “correct” horizontal position that most of the rest of us use; it was only once but it’s a start! Miss Michelle and I just sat there grinning at each other like we had just won the lottery. Best birthday present ever. My mother took us to lunch at a nice little downtown café. Nik was, again, a superstar. He kept asking Nanny “please” for a bit of her soup (no go, it was hot and had crab in it; I didn’t want to find out the hard way that he has the same shellfish allergy I have). He delightedly sucked on a lemon wedge —he is his father’s son, for sure —and even signed “apple” when he wanted more. It took me a minute to realize he was calling it an apple because of the same wedge shape. Pretty clever that kid! He “ate” flatbread crackers, potato chips, tasted my chicken panini sandwich — I finally gave him a bit of the bread which he licked to death. He even tried my dill pickle. When dessert came —yummy crème brulée cheesecake with caramel sauce, raspberry coulis, and whipped cream garnish— Nik went wild. I offered him some bites from my fork but he wanted no part of it. Instead, he reached across the table (when did his arms get so long?? ), grabbed the extra fork the waitress had left, and simply dug in! He was an absolute sticky mess and I loved it. I thought my mother was going to cry. I’m not ashamed to admit that I, um, perhaps, leaked a tad from the corners of my eyes. The photo quality isn’t great (cell phone) but it’s tangible proof! Nik had an awesome afternoon at OT with Miss Debbie. He’s gotten very fast and accurate with sorting colors and objects and almost ready for slightly more difficult tasks. Nik even used some very intentional communication with Miss Debbie about an item he wanted from one of the cabinets. She was so excited by it that she had him do it again just to make certain she wasn’t imagining it; she wasn’t. Niksdad, Nik, and I went out for a celebratory dinner. Ostensibly, it was a celebration of my birthday; it was also a celebration of Niksdad acing his test (as in a full 100%) yesterday morning and of Nik’s amazing progress in the eleven days since we stopped his Lamictal cold-turkey. Nik was a voracious “eating” machine! He wanted some of everything that his daddy had. I wish I had thought to video the moments when Nik, pretzel or tortilla chip in hand, would watch with longing as his daddy would take a bite of a something. From the expression on his face, it was as if Nik were thinking “Hey! I wanted that one!” Priceless. In all, my non-eating son tasted or ate all small quantities of more food in one day than he has in more than two years. By the time we got home from dinner, Nik was pleasantly tired and went right to sleep. His final gift to me? Eleven hours straight through the night! So, while I might not have had a wild surprise party or been showered with lavish, expensive gifts, I can honestly say that my cup runneth over. It almost makes me look forward to forty six. Eighteen months ago Nikolas was eating. It wasn’t a wide variety and it wasn’t anything that involved any sort of chewing or significant oral motor effort —all pureed baby foods with some rice cereal mixed in for extra calories and bulk. But he was eating —nearly one hundred percent of what he was offered every day; this made up roughly seventy percent of his overall diet. We were excited; we thought we were on our way to losing the g-tube —in the home stretch. Then, shortly after Nik began attending school in June 2006, it all came to a screeching halt. We watched as the school OT, then the teacher, then a couple of paraprofessionals all tried different ways to get him to eat. The OT began her campaign while Nik was still eating some —though the quantity was dwindling with each passing day; she was determined to teach him “the right way” to feed himself. “Give us some time to get to know Nik,” she said. “Let us try it our way for a while and see how he does.” To me, that was the beginning of the end of Nik’s eating as we then knew it. By September of that year, Nik was refusing absolutely every attempt to feed him. He was content to sit and clamp his lips together and push away the spoon or throw it if you gave it to him. He would laugh hysterically as if to say “The joke is on you!” We went through great angst over this new development. We saw a behavioral psychologist, outside speech and occupational therapists for evaluations —we even went to Children’s Hospital of Philadelphia (CHOP) to see specialists in the pediatric feeding and swallowing program. No one was able to figure out why Nik wouldn’t eat or what to do about it. I had my theories but couldn’t prove them —that Nik had been forced into something at school and he rebelled. That the total school experience was too much for him and he couldn’t pull himself together enough to eat on top of all the other demands being made of him. I knew then that Nik has significant sensory issues but no one was willing to listen. Even the “brilliant specialists” at CHOP ignored our concerns over sensory issues and discounted the PDD-NOS diagnosis Nik had been given nearly a year before they saw him. Their advice was simply to ignore the negative behavior and it would go away. We knew instinctively that was not the answer. Niksdad and I were frustrated and downhearted about what the future might look like with a feeding tube as a permanent fixture in our lives. For a very long time, I held on to hope and kept trying new things on my own with Nik every once in a while; nothing seemed to help with any measure of consistency. After a while, we stopped trying —we even stopped seeing the behavioral psychologist; after all, she was supposed to help us with the feeding issues and we had reached an impasse. We surrendered to the presence of the hated feeding pump. It is a natural and normal part of being a mother to nurture and nourish your child. Yet, for the second time in Nik’s young life, I felt that I had failed him. When Nik was born, so tiny and fragile, I was unable to breast feed him; he was on a ventilator and I couldn’t produce enough milk. After six weeks or so of valiantly trying to express what milk I had and only getting a few ounces a day, I had to concede that I would not get to experience that critical bonding with my child. Now, nearly three years later, I felt that I had again not measured up as a mother; it was a bitter pill to swallow. 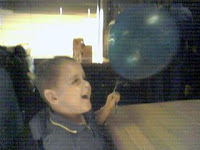 September 2007; we took Nik out of school. We were tired and frustrated and very concerned that our son was retreating further and further away into his own world during the school week and taking days to recover. Every weekend —and every week he was out ill from school —the Nik we knew would start to emerge again only to disappear shortly after returning to school. 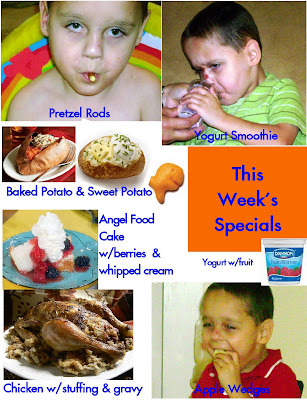 After withdrawing Nik from school, we began to have regular individual OT, PT, and Speech therapy sessions. Bit by bit, Nik began to return to his usual happy, energetic self —in spite of his ongoing health issues. By the time we started with dedicated feeding therapy twice each week, my sense of hope had returned in full. Nik’s therapist, Miss M, is the same SLP that followed him through the early intervention program with Easter Seals; she has known Nik since before his second birthday and loves him like her own child. He adores her and trusts her implicitly; they have a very strong bond and affection for one another. On top of everything else, Miss M gets Nikolas completely. She doesn’t exactly understand the autism piece, but she sees how smart Nik is and how determined he is to communicate and participate in his own ways. She follows his lead and she seeks my input and insights all the time. Nik is still not eating by mouth but he has come light years beyond where he was just three short months ago. Nik is now interested in nearly all food except baby food; if he sees a jar of baby food, he will push it away and refuse to even try it. He wants REAL food —the food all the grown ups are eating. While Nik has not yet figured out the mechanics of chewing —though he is accepting the chewy tubes now where he used to bite them once and then throw them —he has the most advanced licking technique I’ve ever seen. Nik can even manage holding the spoon all by himself to dip into food I offer; he taps the spoon on the edge of the plate to clear the excess, as Miss M does, then licks the underside and the bowl of the spoon. He will not accept the spoon into his mouth or allow it to touch his lips at this point. Yet he will lick food off my finger, and will allow us to rub foodonto his lips —just no spoons! But we’re working on that. Meanwhile, Nik is into all sorts of tastes and consistencies from salsa and wasabi mustard —I kid you not —to garlic roast leg of lamb and black bean chili. If it’s on our plates Nik wants to try it. And we are willing to let him try anything he wants. He’s a big fan of his Nanny’s homemade peppermint ice cream and caramel custard! Nik has never been big on finger foods. He used to get very upset when his hands got dirty; no surprise there to anyone whose kid has sensory issues. As Nik has gotten more exposure to a variety of things both at home and through OT, his tolerance for messy, sticky hands has improved greatly. Where once Nik would pick up a cheerio or a goldfish cracker and throw it, he now brings them to his mouth to sample. Often he will throw the first half dozen or so before he settles on one to savor —licking, kissing, and sucking on the poor thing until it’s a mushy mess. Nik has taken a bite or two of solid crunchy food before but it was kind of snuck in by using a thin pretzel stick in the chewy tube. The first time scared him so badly he wouldn’t even touch the chewy tube for a few days. Miss M said that’s normal; the sound is usually very startling. She said it sometimes takes a while after that for a child to try again. She was right; just this week, Nik took his first voluntary bite —completely unprompted. He had been savoring one particular goldfish cracker, holding it by the head, when he gently put his teeth on the tail fins. He didn’t apply any pressure; he just felt the fish between his teeth for a moment. He took it out of his mouth and looked at it with a mixture of pride and curiosity. Going back for a second attempt, Nik applied more pressure this time and broke off a fin in his mouth. Both Miss M and I held our breath as we waited for Nik to begin to gag. The gag never came. Nik didn’t swallow the piece (which was about the size of a grain of rice) but he didn’t gag; he merely worked his tongue around until the bit of cracker was forward enough for him to remove it with his fingers. Miss M and I cheered loudly. We haven’t yet seen a repeat performance but I know it is coming —Nik is far too interested in food not to persevere. I believe and trust in my gut that the day is not far away when Nik will figure out this business of chewing —of eating. And when he does, I expect he will take on the world —one bite at a time. In the life of every parent, regardless of age, gender, socio-economic status or political beliefs, there comes the first of many moments which define you beyond the mere biology which has led you to a point non plus. When is it acceptable, nay encouraged, to reward or celebrate bad behavior? This is the cross-road at which I found myself this morning. Nik and I had a very busy morning today. We woke before dawn —Nik’s bedtime dose of Advil having worn off around 4:30 a.m. —to greet the day with squeals and cries of delight (his, not mine) interspersed with sporadic head banging (mostly Nik). After a spot of breakfast, we packed up our gear and headed off to our morning workouts. Nik’s first —an hour spent in the delightful company of Miss D and Miss T for both OT and PT —followed by my session with my trainer at the Y.
Nik was in fine form this morning. Happy and highly interactive, he greeted Miss D with a big smile then promptly giggled and ran across the room; it’s a delightful new game he’s begun to play, called “Catch me if you can.” The adventures continued through the dual session as Nik independently climbed up the ladder (!!) to the platform above the slide and ball pit. The first time around he waited for Miss D to hold his hands and then he jumped into the ball pit. The next time through he waited for Miss T to encourage him to do it again —then veered at the last second to slide head first down the sliding board. It is a hoot to watch; Nik points one toe straight out behind him and flexes the other foot to rub the toes along the inside of the slide as a tension-type braking mechanism. All the while he holds onto the outside of the slide with his hands. The result is a perfectly controlled, danger-free sensory delight! Now, you may be wondering where the bad behavior comes in to play, yes? Apparently, it only happens when Mommy’s not around! REWIND! !…Did she say stealing snacks? From other kids? She must not know who my child is. My happy loner who doesn’t eat a morsel of food by mouth. Obviously, she’s got him confused with some other cute little boy, right? My face must have said it all. She laughed and said, “Yes, Nik was stealing snacks. He stood and watched the other kids and, when they’d look away, he snuck right in and grabbed some off the table.” Apparently, he even made an attempt —lip service if you will —at eating one. Once he realized it was actual food and not a toy, he spit it out immediately. Apparently, licking food is OK, eating it is another matter entirely. I nearly fell over from the dizzying rush of shock and pride. Attention to other children around him? I think I’m going on vacation; clearly, my work here is done.